And for two times the fun (and work) I bought http://lazybudgetchef.com too! I designed two new blog buttons with each new url for those of you who like blog buttons. You should not notice a difference if you read Condo Blues via the RSS Feed or email subscription. If you linked to a post under my old blogspot urls (thank you!) 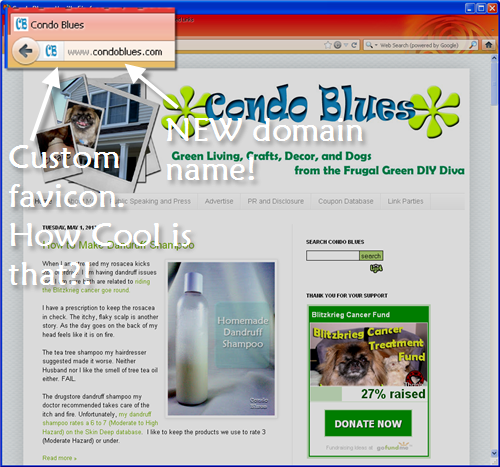 I set it up to redirect to the same post at condoblues.com and lazybudgetchef.com. I’ve been putting off moving from condo-blues.blogspot.com to condoblues.com for far too long. 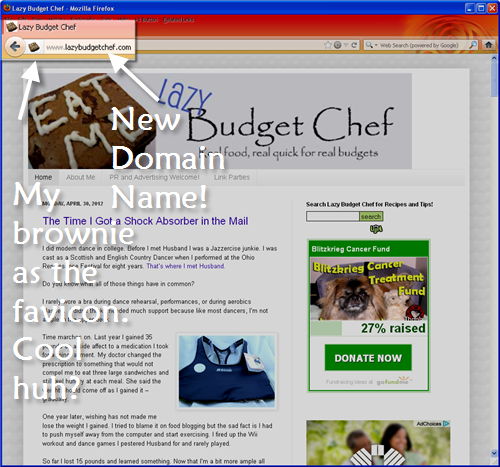 A kind blogging friend mentioned ever so nicely that I should move my blogs to their own domains for business purposes. She reminded me it takes money to make money and that will help with the Blitzkrieg situation. I’m sorry I helped Lisa fake you out but she paid me off in treats to go along with it. What can I say? I am a dog. I like food. I worried in such a way that kept me up at night (as stressful things do. It is the price of being me) that you would think I am a bad steward of your Blitzkrieg donations because I made this purchase. Since I’m talking about money things, I feel that I should bring this up too. Rest assured that everything you donate to the Blitzkrieg Cancer Treatment Fund goes to pay for his chemo treatments. Your kind donations that paid for the first two and a half chemo treatments helped us so much with the expected expense and plan for the next six months of Blitzkrieg’s cancer treatment. Moving to my own domains will help me with my May One Small Green Change: Sell It! I normally donate our old stuff, get a receipt from the thrift store, and take it off our taxes as a charitable donation. This month, I’m going to try selling our extra stuff on eBay and Craigslist. It is greener way than dumping our stuff into the trash and on to the landfill. I’m also going to try my hand at making and selling green crafty things at craft shows and on consignment too. Selling our extras and crafts will help offset the cost of upcoming expenses, including my trip to the BlogHer conference. I wanted to cancel but Husband insisted I go to thank as many of you in person as I can. I am looking for sponsors for the BlogHer Conference. If you are looking for a social media rock star to promote your brand at BlogHer, email me at condoblues (at) gmail DOT com. Besides, Husband likes the Guy Time he gets to spend with Blitzkrieg when I’m gone. These are the faces of two guys who spent countless hours chilling on the sofa watch Jack Bauer Power Hour marathons and taking lots of walks while I was at Blissdom. Welcome to my new virtual home! Same tips. Same green living. Same nutty commentary by my boy Blitzkrieg. The only thing that's changed is the URL. It's all good and thanks for the update and best wishes on the new digs.